Well, winners will be announced by midnight! I missed the boat on the giveaway, but glad to hear Anker is welcoming input. I haven't found a reliable, small, 12VDC to 120VAC inverter that meets my needs for an automobile yet. The BESTEK 150W Power Inverter looks good form factor wise, but I wouldn't trust their USB charging ports to quickly charge a smartphone or tablet. * must be able to be stored in glovebox or center console when not in use. Somewhere between a deck of cards and the PowerPort 10. The PowerPort 5 is a great size. Thinner is better, as then it would be able to hide between the passenger seat and center console. * ideally fanless, but a quiet fan is acceptable. * one AC mains ports. * at least one 2A+ USB-A port, preferably two 2.4A USB-A ports (24W) with PowerIQ and/or QC2.0+. * optionally one or two 3A+ USB-C port. * intelligently handle over-current, over-voltage, and under-voltage conditions, as well as handle over and under temperature conditions. * If it's meaningful, some visual indication if the inverter is operating at 100% or is limiting any of the outputs. * Don't blow the car's fuse to the DC socket. Will Anker be releasing more inverters after the recent release of the PowerHouse? I would love to see a pocket clip for the LC40 and maybe LC90 flashlights. I use the LC90 around home and when outside at night but I always carry my LC40 either on my or in my backpack. It does like to move around when I'm walking in my pocket and a small clip on the back would prevent that. The clip would also keep the flashlight from rolling when set down sideways on a flat/slanted surface, which I read a few reviews about people saying it would roll away when laid down. If Anker added the pocket clip to the tail cap/button assembly removable, small screws or a strong snap into place, it would probably make the LC40 more appealing to more people to carry every day with them. It would also be nice to just buy a tail piece separate, if they decide to upgrade them, so I could just add them to my existing lights. Overall I love the LC40 and LC90, my Powercore+ 10,000 with QC 3.0, and my vast amount of cables and plugs for them. Anker makes great products and stands strongly by them. I read many reviews on Amazon where someone posted an unsatisfied review about there being a problem and Anker goes out of their way to make them a satisfied customer. And to me that is the second thing I look for in a company after quality products. I know this is after that contest but I felt that I should share this with everyone. I know the competition is now closed but I thought I would post anyway. I have one of the Anker MP141 Bluetooth speakers and I love it but I now have an amazon echo dot and it would be great if Anker made a Bluetooth speaker which matched the echo in diameter and was designed to have the echo slide into the top in a recess or something. I know amazon sell the full-size Echo but the Echo Dot is £100 cheaper in the UK and Anker products are so reasonable you could have an Echo Dot and a BT speaker for around half the price of the full-size Echo. Also, it would be cool if it had a power passthrough to allow both to be powered by one PSU and possibly power the echo from the built-in battery if you wanted to take it into the garden for a party or whatever. I know the contest has ended. This may have already been suggested but maybe a slimline wall charger that sits flush against the wall/outlet with side ports? Basically for places with tights spots, like behind couches, beds, or any furniture that blocks an outlet that sits close to the wall. If i were any good at Photo editing i would build an example. I'm also a huge fan of laptop chargers as previously mentioned. There are a lot of "universal" chargers out there that don't regulate power properly and damage devices, or they are just very cheap and fall apart. I think doing some chargers for laptops would be a great addition to the line of products. So I like the creativity. 1 concern and 1 alternative. If, by definition, this is cramped situations where the humble charger is pressed up agaiinst furniture etc, as these sort of devices are in the 90% efficient region, the 4 port 40W device would be shedding 4W as heat, if that heat could not dissipate in air but is insulated by the furniture, what is the risk that it will overheat, damage itself or damage the furniture? What I do is either use a Powerport5 which has a cord, I then drop the charger to the ground with air circulating so it can cool, or I use a short T shaped extension cord to emerge flush from the wall and then plug in at ground aired cooling place. I know the rule of the more it does the the less it does it well. But I would like to see a 2+ USB port battery pack that has built in wall and car chargers. Anker already does all of these well, could we just combine it all into one? I'd like to see a charging case. The ones I've looked in to from other manufacturers have such mixed reviews, and don't seem to work well over time. I have enough confidence in Anker that I'd gladly buy one whenever I get a new phone. Other than that, laptop batteries. I've had my laptop since 2010 and I'm on my 3rd battery. I may have mentioned that already earlier, but I honestly don't remember at this point. It would be great if Anker could make a universal laptop charger. Lvsun seems to be making the best universal laptop chargers that I can find and often making ones with builtin usb ports to charge other devices as well. If Anker could make something similar with the same quality they put into their other chargers and market it as something you could put multiple laptop adapter pieces on, charge other devices (possibly with the new speed technology they have been pushing), maybe even take it a step further and develop a better way to put the cords away or store the adapter pieces, they could easily beat out any of the current options. They could also throw in a usb cord and case and call it the lap power pack. 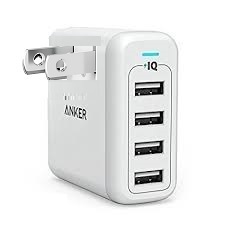 I'm suggesting this because I need one now actually and I wanted to get it from Anker but sadly I'll just have to hope that the $30 I'll spend will be worth the charger I have to get. I'd like to see reversible Micro USB nylon-braided cables make it into your lineup. The Micro USB ends of these cables usually don't grip very long and are a pain to insert in low light or in the dark. Make them double reversible: the USB Type-A side and the Micro USB side. I'd also like to see a Bluetooth 4.1 Transmitter & Receiver with Digital Optical TOSLINK, 3.5mm Aux Audio and support for aptX Low Latency. Bluetooth-enabled Quick Charge 3.0 (or higher) dual port car chargers that allow you to locate your vehicle with an app. USB-C 3.1 hub with UHS-II card reader, USB 3.0 ports, HDMI and USB-C ports, as well as Power Delivery. A desktop version and a laptop version. Years ago, Apple made an IR play/pause/volume remote for their MacBooks. It was a good and cheap way to control the audio on a laptop. Today, none of their laptops have the IR receiver; the remotes are a vestigial relic. How about a 1-key BT keyboard which sends out the 1-key combination Command-SPACE? It would be the "Hey, Siri!" keyboard. It would be a way to remotely summon Siri on any Apple laptop or desktop computer. There's no need for audio: the computer would be close enough. Such a remote would be an upgrade of the old remote: pause/play, change volume, dim the screen, google something, etc. A small battery rechargeable via micro-USB would be perfectly fine. Lightning compatible charger would be better -- as long as the Apple bureaucracy doesn't crank up the cost. I knowy your contest is over, but I'd love to see this. Thanks. It would be great if you had a powerbank with usb'c and quick charge 3.0 or one that has 2 quick charge 3.0 outputs. A Bluetooth-enabled Quick Charge 3.0 (or higher) dual port car charger with one of the ports being a Type C port that supports Power Delivery. The car charger would also allow you to locate your vehicle with a smartphone app. Over the ear premium headphones with Bluetooth 5, aptX Low Latency codec, SBC codec, NFC support.